EPF members whose claim status shows settled & sent via NEFT will get their PF amount into their bank account within 2-3 days (When there are no bank holidays). But sometimes even after 2-3 days also some EPF members don’t get their PF amount. In most cases, the reason for not getting PF amount after claim settled message is incorrect bank account details. Here we will discuss what are the possible ways to get back the PF claim amount. Note: Remember when you have submitted both PF form 19 and 10C then you will receive both amounts within 1 or 2 hours gap. If you haven’t checked your PF claim status till now then check your PF claim status, the procedure is given below. Step 2:- Now enter your UAN number and captcha appearing on the screen. Step 3:- Now select PF member ID for which you have submitted your PF claim. Step 4:- Now your PF claim status will appear on the screen. 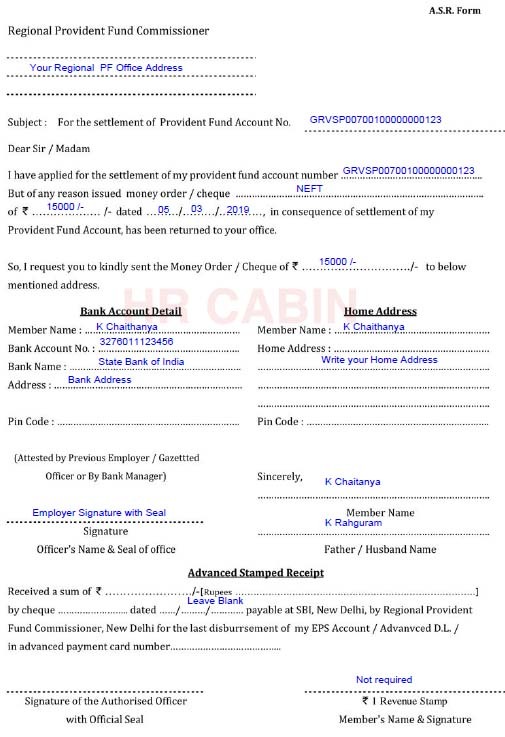 Claim Form-19 (EPF Final Settlement)(Resign) Claim id-GRVSP171100006806 Member id-GRVSP00700040000000123 has been settled. Payment sent on- 21-NOV-17 via NEFT. Claim Form-10C (EPS Withdrawal/SC)(Withdrawal Benefit / Scheme Certificate) Claim id-GRVSP171100006808 Member id-GRVSP00700040000000123 has been settled. Payment sent on- 21-Nov-17 via NEFT. Submit PF Reauthorization Form for Offline Claims. Contact PF Officials through Social Media Platforms. If you have claimed your PF amount online at UAN member portal, then correct your bank account details at UAN portal and ask your employer to approve them. The approval process doesn’t take much time, it can be done in a few minutes. Once your employer approves your bank account details in their employer PF portal then you need to claim your PF amount again at UAN member portal. If you want to know the complete process then read this how to correct already approved bank account details. For offline PF claims, if you find that your bank account details are wrong then fill a PF reauthorization form with correct bank account details and submit it to your regional EPF office along with a canceled cheque or bank passbook copy. After submission of PF reauthorization form, your PF amount will credit into your correct bank account within 7-10 days. If you still don’t know the proper reason for non-settlement of PF claim then you can contact the EPF grievance portal. You need to raise a grievance at PF portal, once your grievance is registered then you can get a reply from your regional EPF office with a proper reason. If you are not satisfied with all the above options, then the final option is to take your problem to the EPFO through their social media platforms especially EPFO Twitter Account. 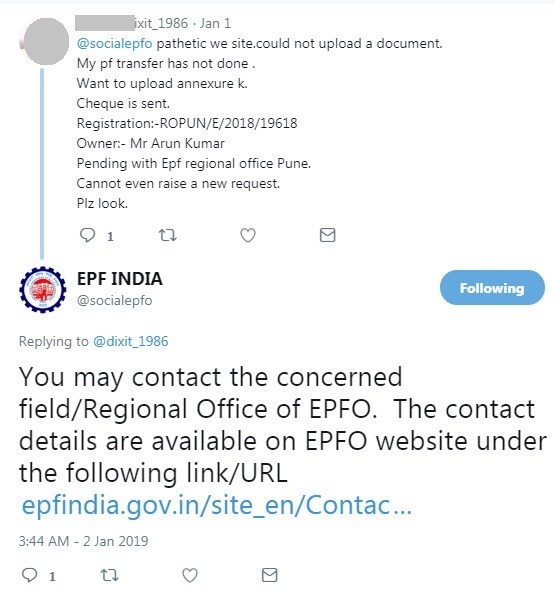 Nowadays EPFO is very active on Twitter and they are addressing each and every query of EPF members so you can use their Twitter account to address your problem. Employee Provident Fund Organization (EPFO) sends EPF claim amount through NEFT ( National Electronic Fund Transfer). NEFT is an electronic money transfer system to transfer money from one bank account to another bank account. The time taken for PF withdrawal depends on the NEFT timings of your bank. Here are the NEFT timings of some popular banks in India. If you have submitted PF transfer form 13 either in online or offline then you need to wait for at least 30 days. Once the PF transfer to your new PF account then you can withdraw it. But remember while PF transfer process only PF amount will transfer into your new PF account, pension amount will no transfer, it will be saved as service history. So if pension amount doesn’t transfer then it is doesn’t mean that your claim is not transferred. To know more details read this why my pension fund not transferred along with PF. This is another rare case where EPF members receive PF claim amount but they don’t’ get full PF amount, it happens rarely. So before applying for PF claim it is better to check your PF passbook, so that you will have an idea about how much PF amount you will receive. And remember if you have applied for both PF and pension by submitting PF form 19 and 10 C respectively then you will receive both amounts in few hours gap. Still, if you find you don’t receive your full PF amount then raise a grievance at the PF portal, they will tell you the exact reason for less PF credit. Yes, even for online claims also when they do not settle due to incorrect bank a/c details then they can submit PF reauthorization form or they can reapply for the claim, it is your choice. I have applied advance pf amount last month 22 Feb but till now status is showing under process.. How much days it will take? I have applied for PF & Pension Withdrawl through UAN portal, Now Status is showing for EPS- Settled but amount is NA, And in EPF option showing – Status not available. I have request via online portal and i submitted request on 21th FEB.
at the moment the status is cliam was reject . How many times we have withdraw pension advance from our current Employer? I have applied my PF online claim (Form 19 & 10C) on 25.02.2019 successfully with claim status under process for both but on 09.03.2019 Form 19 was rejected without any reason (it has been rejected due to:–) and form 10C was under process. Form 10C was settled on 10.03.2019. Again with dispatch date on 13.03.2019, claim status Settled But Returned with remarks Payment sent via NEFT has been returned on 13.03.2019 whereas my bank details are same. So, right now I am very much confused about this as my KYC is correct, so what to do?? Please help me. Raise a grievance at PF portal so that you can know why they rejected your claim.